Stopz Mold & Mildew Resistant*, All Purpose, Primer/Finish is an extremely effective 100% acrylic, water-based primer for use on most interior and exterior surfaces. It is also effective for interior finishes in areas susceptible to mold and mildew growth. 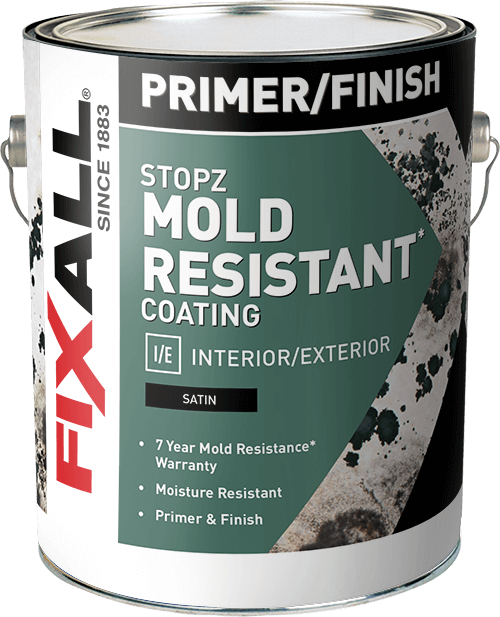 Stopz Mold & Mildew Resistant* All Purpose Primer is recommended for use on interior wall surfaces such as plaster, wallboard, Sheetrock®, concrete, masonry block, wood, primed metal and galvanized metal. This product is also recommended for use on interior or exterior wood framing, primed metal, concrete, and wallboard inside the wall cavity. Do not use for HVAC system application.